The beautifully crafted floor plan of this gorgeous model home features 4 bedrooms, 2 1/2 bathrooms, covered front entry, stately study, cook’s kitchen with spacious pantry, breakfast nook, great room with gas fireplace, upstairs laundry, master bedroom with large walk-in closet, storage area, expanded deck, 3-car split garage with owner’s entry, 9’ full unfinished walkout basement, and humidifier. Follow 88th Avenue West to Indiana, turn right. Take Indiana North to Candelas Parkway, turn left. 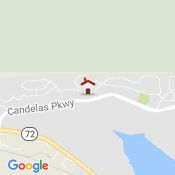 Follow Candelas Parkway West to Salvia Street, turn right. Turn left on 94th Avenue.